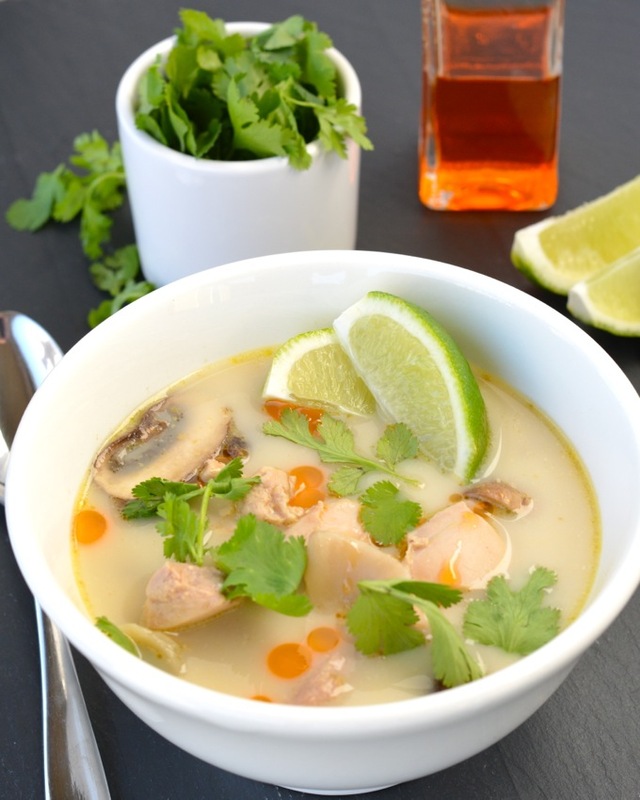 This Tom Kha Gai soup is a wonderful Thai Coconut Chicken Soup, flavored with lemongrass, ginger and lime. It’s Thai takeout you can make at home! We don’t have a ton of great restaurants in our area, so we don’t eat out very often. That’s just fine by me since I like to cook at home anyways, plus it’s a whole lot healthier. We do happen to have two decent Thai places near us, so we eat Thai food pretty often. Any time we need takeout, that’s what we usually get. And any time we actually go out, it’s usually Thai, too. We love Thai food, so it works out pretty well. We definitely have our go-to dishes. No matter where we get Thai food, Nick almost always gets Pad Thai, and I almost always get Pad Kee Mao. They rarely disappoint, so we rarely branch out. In the last couple months, I went to Thai food with a couple different friends. When they both ordered the same thing– Tom Kha Gai soup– on separate trips, I figured I had to try it and see what all the fuss was about. I did, and it was amazing! 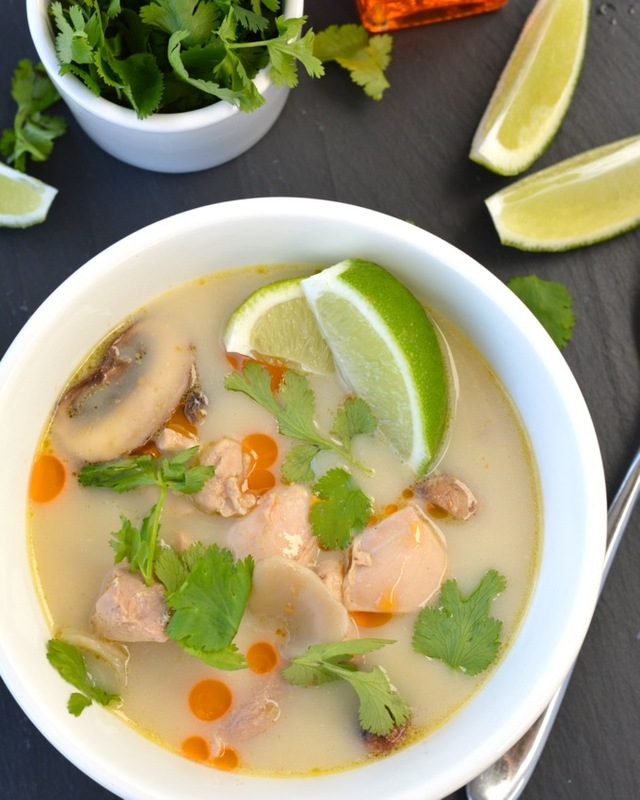 It’s a delicious chicken soup with coconut milk and all sorts of yummy Thai flavors like lemongrass and cilantro steeped in. On my next trip to Thai food with Nick, I made him try it. And now we have a new go-to dish! So yummy. Since I’ve mastered our other favorites at home– Pad Thai and Pad Kee Mao— and make them from time to time, I decided to try making Tom Kha Gai at home, too. I wasn’t sure if I’d be able to find all the unique Thai ingredients, but between Whole Foods and a couple substitutions, it worked. Tom Kha Gai is traditionally flavored with lemongrass, kaffir lime leaves and galangal root. This version uses lemongrass (which I found in the herb section of Whole Foods– and I plan to try planting in my garden soon), and substitutes regular lime zest and juice for the kaffir lime leaves, and ginger root for the galangal. Most of the restaurant versions of this soup I’ve had use straw mushrooms. I couldn’t find them anywhere, but any funky mushrooms will work– oyster, maitake or shitake. If you can’t find any of those, criminis or even button mushrooms will work in a pinch. I used a combination of maitake (found at Whole Foods) and criminis. On the search for an at-home version, I found this recipe from Bon Appetit magazine, and went from there. Using the back of a knife, lightly smash lemongrass and ginger. Bring lemongrass, ginger, lime zest and juice, broth and water to a boil in a large soup pot. Reduce heat and simmer until broth is flavored, 8–10 minutes. Add chicken and return to a boil. Reduce heat, add mushrooms, and simmer, skimming occasionally, until chicken is cooked through and mushrooms are soft, 20–25 minutes. Remove lemongrass, ginger and lime zest strips and discard. Serve immediately with chili oil, cilantro, and lime wedges. This soup came out so delicious! Since I like it extra spicy, I ended up stirring in a little sriracha, too. As with most soups, this one got better and better the longer it sat in the fridge (which… wasn’t very long before it was all eaten up!). The flavors were so fresh and bright. This was the first time I’ve cooked with lemongrass and I loved it, so now I’m on the hunt for some to plant in the garden! We just recently decided to have family theme dinner nights once a week and the first vote was for asian food so this makes the cut. We happen to love Thai food too. Can’t wait to try out this soup! I am always looking for unique dishes! How fun!! I love theme dinners!! Asian food at home is definitely one of my faves! Jess I love thai food but never really made much at home! This looks like a good starting point! I love Thai food but surprisingly I’ve never had coconut soup! This looks delicious, Jess — I’m going to have to try this out! I hadn’t either until recently– but it’s SOOO good! Now I’m hooked! This looks really classy! What a fun ethnic dish! I love all your Thai food recipes! I’ve never used lemon grass before but everytime I see it I feel like I should try it out! This soup sounds so flavorful and delicious! Love, love, love the ingredients in this soup, Jess! I love Thai soups, and everything is better with coconut! YUM. Pinned! We love Thai food and used to always get take-out too. Your coconut soup looks delicious! Love all the swaps you used, it sounds perfect! Thanks, Kelly! It was so yummy! Wow this looks just great! I don’t have very much experience with Thai food, but I need to experiment a bit! I’ve had this soup in Thai restaurants before, and Seth and I love it! I have never tried making it at home, but I definitely need to! Great recipe :). OK, everyone is always all about the Tom Yum soup, but seriously Tom Kha Gai is my FAVORITE! I seriously ate it at least once a day when I was in Thailand! Looks delicious, Jess! I’ve never had Tom Kha Gai soup, and don’t eat Thai food all that often, but this looks delicious! Now I’m wanting to try a coconut soup! Thai food is always what I crave when I go out to eat. But I have to admit that I don’t cook it at home very much. I need to start ASAP. And I think this soup is a good place to start. Looks so comforting, yet still light enough for spring! What a pretty soup, Jess! I love the colors! That the thai and coconut combo sound just perfect. I bet this tastes amazing! I love Thai food – especially Pad Thai – but have always been too intimidated to make it at home. Your soup is beautiful and looks delicious. I had no idea it could be so easy! I absolutely want to try it now! You should!! Pad Thai is really easy, too! And soooo yummy (and probably way healthier) when you make it at home, too!